er liked Berlin. He saw it as a dirty, liberal-minded place and was disdainful of its leftist political leanings. But he had an idea for fixing it after World War II came to an end. 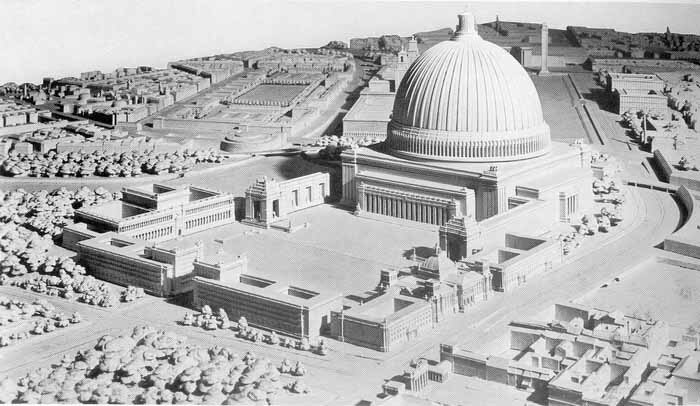 His famous vision of Berlin for 1950 -- planned in detail by his architect, Albert Speer -- was a grand Fascist city called "Germania"
refers to the projected renewal of the German capital Berlin during the Nazi period, part of Adolf Hitler's vision for the future of Germany after the planned victory in World War II. 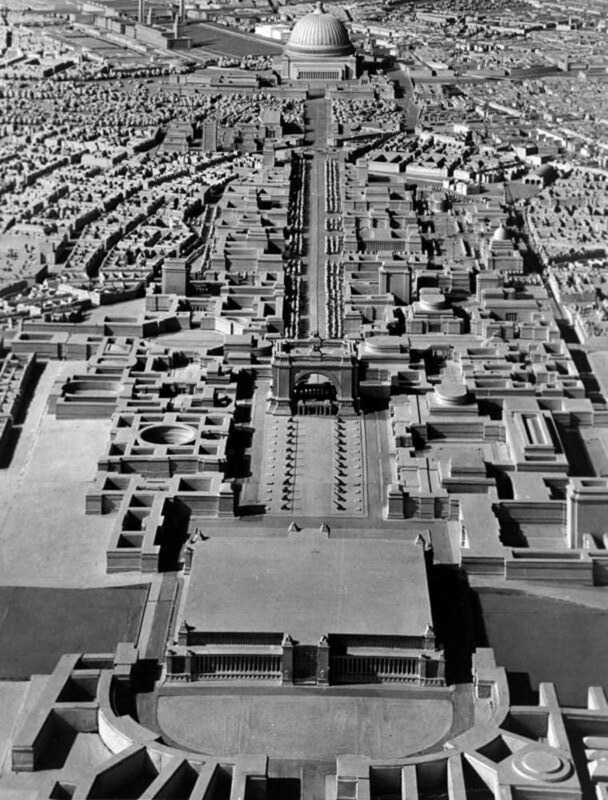 Albert Speer, the "first architect of the Third Reich", produced many of the plans for the rebuilt city in his capacity as overseer of the project, only a small portion of which was realized between the years 1937-1943 when construction took place. Some projects, such as the creation of a great East-West city axis, which included broadening Charlottenburger Chaussee (today Straße des 17. Juni) and placing the Berlin victory column in the center, far away from the Reichstag, where it originally stood, succeeded. Others, however, such as the creation of the Große Halle (Great Hall), had to be shelved owing to the beginning of war. 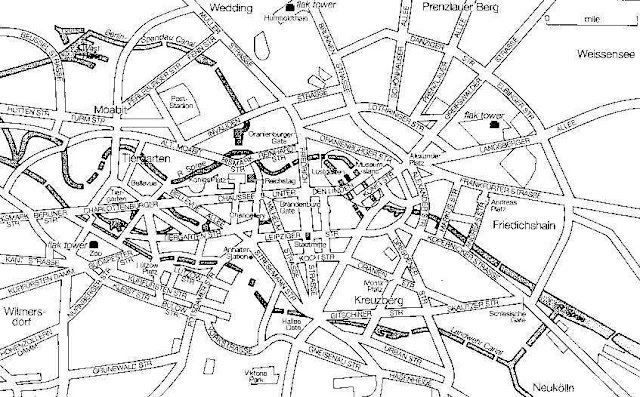 A great number of the old buildings in many of the planned construction areas were however demolished before the war and eventually defeat stopped the plans. The combined name "Welthauptstadt Germania" for the project was coined by Albert Speer in his 1969 memoirs Inside the Third Reich. 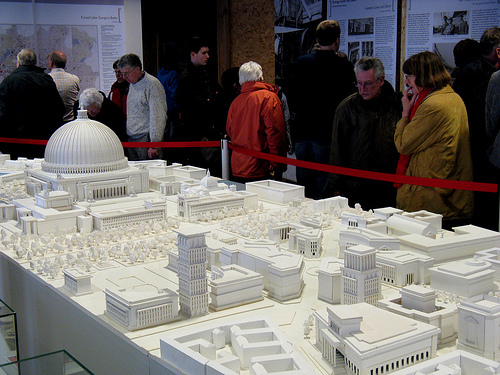 Although it was never used in any official capacity by the Nazi government nor even by Hitler himself, it has since become synomynous with the Nazi-era construction plan for Berlin, which was named the "Comprehensive Construction Plan for the Reich Capital" (German: Gesamtbauplan für die Reichshauptstadt). "Just as the Bavarians and the Prussians had to be impressed by Bismarck of the German idea, so too must the Germanic peoples of Continental Europe be programmatically steered towards the Germanic concept. He [Hitler] even considers it good that by renaming the Reich capital Berlin into 'Germania', we'll have given considerable driving force to this task. The name Germania for the Reich capital would be very appropriate, for in spite of how far removed those belonging to the Germanic racial core will be, this capital will instill a sense of unity. —Andreas Hillgruber: Henry Picker. 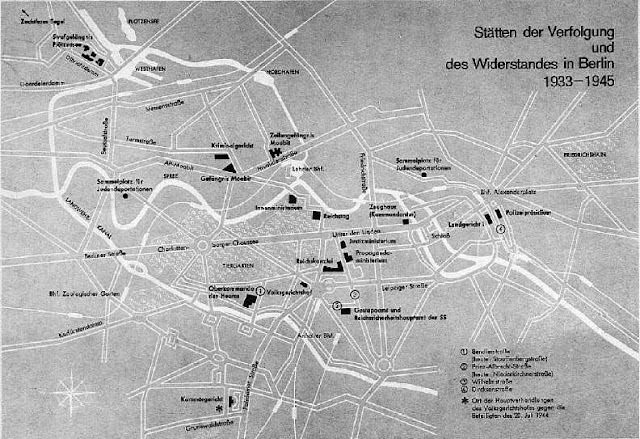 Hitlers Tischgespräche im Führerhauptquartier 1941–1942, p. 182. Munich, 1968. "Berlin as the World Capital will only be comparable with Ancient Egypt, Babylon, and Rome! What are London and Paris compared to that!" —Werner Jochmann: Adolf Hitler. Monologe im Führerhauptquartier 1941–1944, p. 318. Munich, 1980. The first step in these plans was the Olympic Stadium for the 1936 Summer Olympics. This stadium would promote the rise of the Nazi government. A much larger stadium capable of holding 400,000 spectators was planned alongside the Nazi parade grounds in Nuremberg but only the foundations were dug before the project was abandoned due to the outbreak of war. Had this stadium been completed it would remain the largest in the world today by a considerable margin. Speer also designed a new Chancellery, which included a vast hall designed to be twice as long as the Hall of Mirrors in the Palace of Versailles. Hitler wanted him to build a third, even larger Chancellery, although it was never begun. The second Chancellery was destroyed by the Soviet army in 1945. 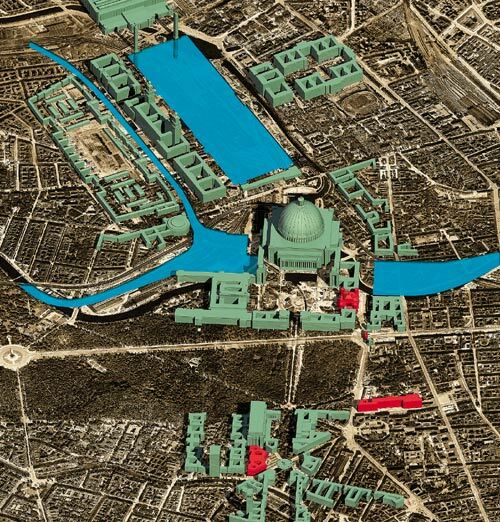 Almost none of the other buildings planned for Berlin were ever built. 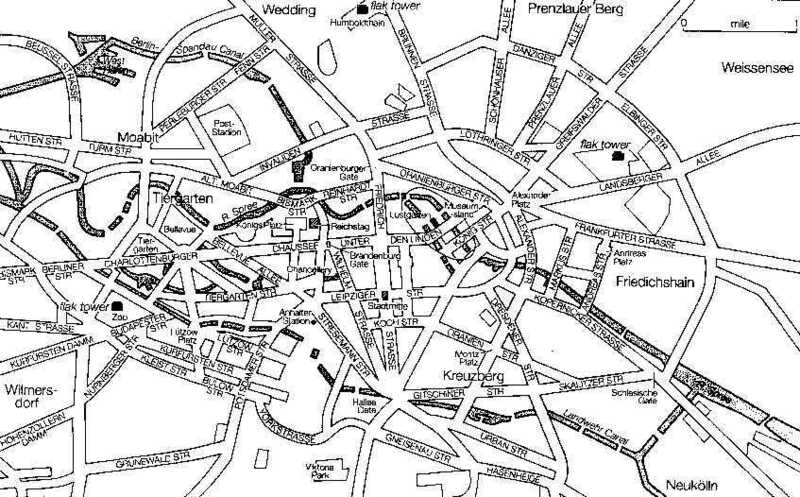 Berlin was to be reorganized along a central 5 km-long boulevard known as the Prachtallee ("Avenue or Boulevard of Splendour(s)"). 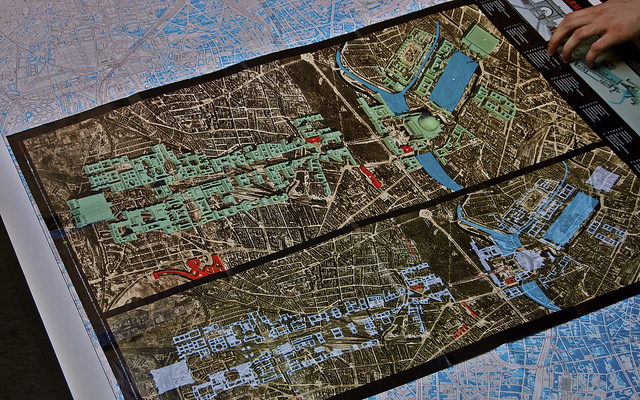 This would run south from a crossroads with the East-West Axis close to the Brandenburg Gate, following the course of the old Siegesallee through the Tiergarten before continuing down to an area just west of Tempelhof Airport. This new North-South Axis would have served as a parade ground, and have been closed off to traffic. 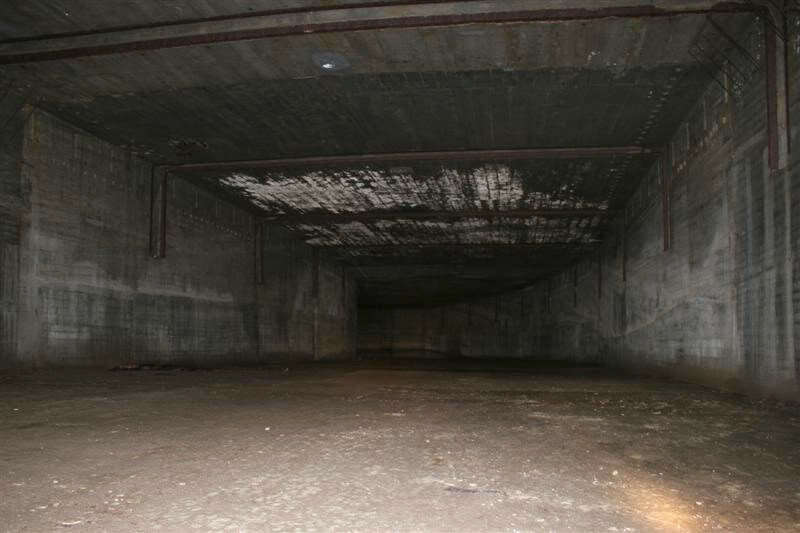 Vehicles would have instead been diverted into an underground highway running directly underneath the parade route; sections of this highway's tunnel structure were built, and still exist today. No work was ever begun above ground although Speer did relocate the Siegesallee to another part of the Tiergarten in 1938 in preparation for the avenue's construction. The plan also called for the building of two new large railway stations as the planned North-South Axis would have severed the tracks leading to the old Anhalter and Potsdamer stations, forcing their closure. These new stations would be built on the city's main S-Bahn ring with the Nordbahnhof in Wedding and the larger Südbahnhof in Tempelhof-Schöneberg at the southern end of the avenue. At the northern end of the avenue on the site of the Königsplatz (now the Platz der Republik) there was to be a large open forum known as Großer Platz with an area of around 350,000 square metres. This square was to be surrounded by the grandest buildings of all, with the Führer's palace on the west side on the site of the former Kroll Opera House, the 1894 Reichstag Building on the east side and the third Reich Chancellery and high command of the German Army on the south side (on either side of the square's entrance from the Avenue of Splendours). On the north side of the plaza, straddling the River Spree, Speer planned to build the centrepiece of the new Berlin, an enormous domed building, the Volkshalle (people's hall), designed by Hitler himself. 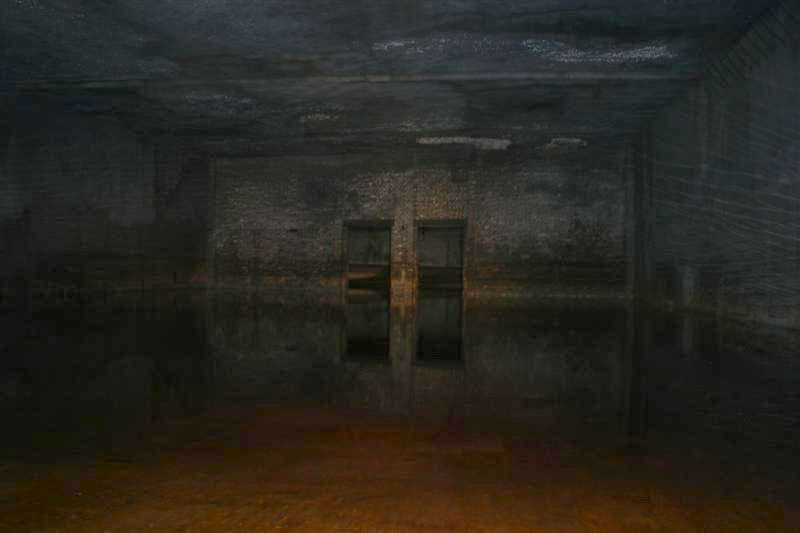 It would still remain the largest enclosed space in the world had it been built. Although war came before work could begin, all the necessary land was acquired, and the engineering plans were worked out. The building would have been over 200 metres high and 250 metres in diameter, sixteen times larger than the dome of St. Peter's. Towards the southern end of the avenue would be a triumphal arch based on the Arc de Triomphe in Paris, but again, much larger; it would be almost a hundred metres high, and the Arc de Triomphe (at the time the largest triumphal arch in existence) would have been able to fit inside its opening, evidently with the intention of replacing the rather long history associated with this Arch and in particular the unique ceremonies, with reference to the history of France, connected with it, see the French government website on this history. As a result of the occupation of Berlin by Soviet troops in 1945 a memorial was constructed with two thousand of the Soviet dead buried there in line with this proposed 'Triumphal Arch'. It had been intended that inside this generously proportioned structure the names of the 1,800,000 German dead of the First World War should be carved, that which presumably was known to amongst others the Soviet leaders. 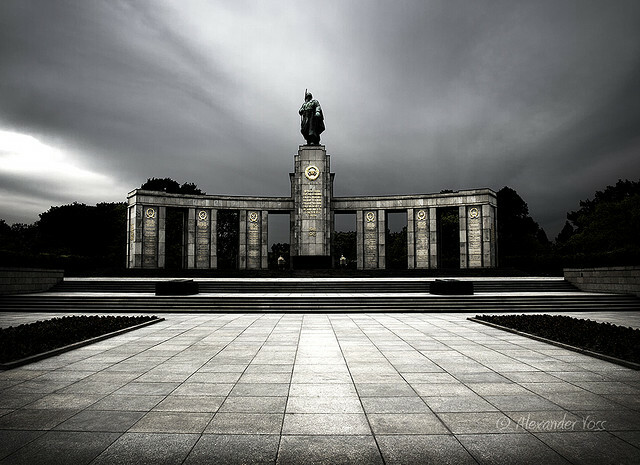 This war memorial was built to honour the Soviet soldiers that fell in the battles against the German army in the Second World War. It was located at the 17 June Street very close to the German parliament - the Reichstag - in what would soon become West-Germany which meant that it was beyond everyday reach for the Soviet Army. To be able to visit the memorial it was agreed that Red Army troops had free passage to the memorial on certain days of remembrance. Around the time in the early 1960ies when the Berlin Wall was erected the presence of Soviet troops on the streets of Berlin awoke much anger among the West-Berliners and Soviet military veichles was on many occassions bombarded with stones from angry protestors. The memorial is constructed as an arch with a bronze soldier on top pf it. 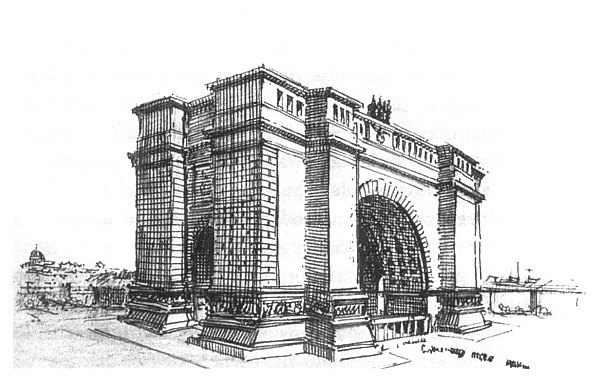 The design actually resembles the Brandenburger Gate which is located only 100 metres away. 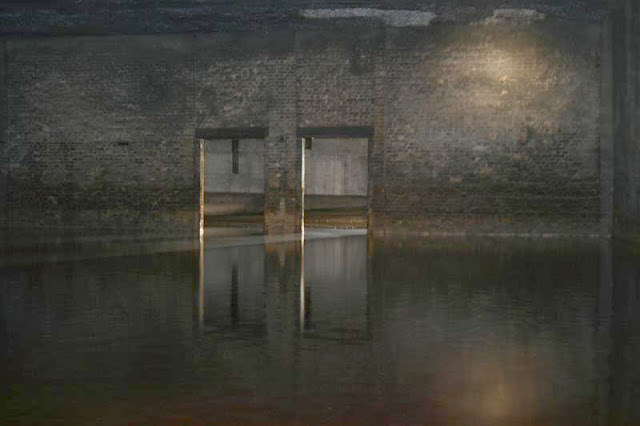 Doubts persisted at the time as to whether the marshy Berlin ground could have taken the load of the proposed projects, leading to the construction of an exploration building (Schwerbelastungskörper, literal translation: Heavy load-bearing body), which still exists on the site where the Arch of Triumph would have been built. 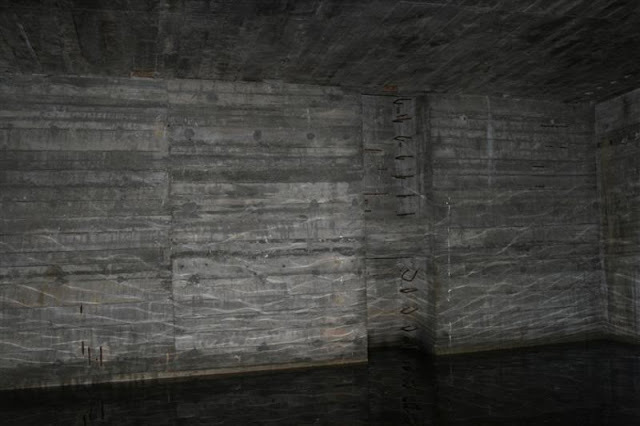 It is basically an extremely heavy block of concrete used by the architects to test how much weight the ground was able to carry. Instruments monitored how far the block sank into the ground. The Schwerbelastungskörper sank 18 cm in the three years it was to be used for testing, compared to a maximum allowable settlement of 6 cm. 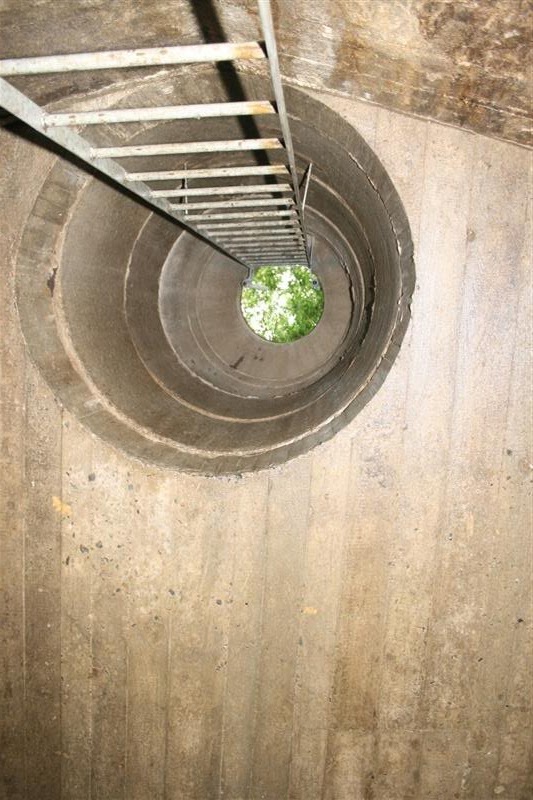 Using the evidence gathered by these gargantuan devices, it is unlikely the soil could have supported such structures without further preparation. 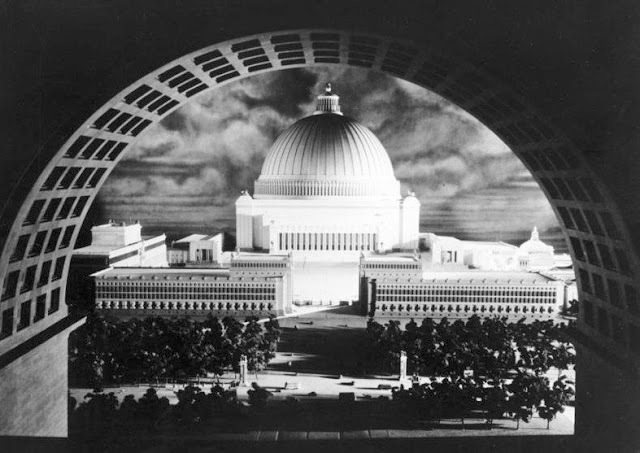 At the time of the initial invasion of the Soviet Union (Operation Barbarossa) in June 1941, Hitler expected to win victory in World War II by 1945, and he then planned, after completing the construction of the Welthauptstadt Germania plan, to hold a great World's Fair in Berlin in 1950 and then retire to his hometown of Linz. The alternative history novel Fatherland (1992), by Robert Harris envisages a Nazi Germany that won the Second World War, and has eventually realised Hitler's and Speer's vision of a rebuilt and monumental Berlin by about 1964. 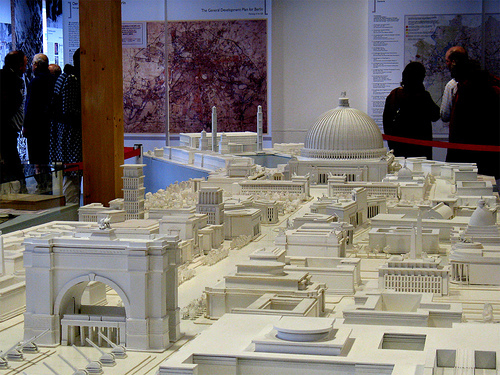 The 2004 film Downfall portrays Hitler wistfully looking over a model of the planned city. He later makes a comment about the city while awarding Iron Crosses to Hitler Youths outside the Führerbunker. were part of the project several tunnels coming in and out from Berlin that would integrate massive highways, these tunnels would reach 8000 km in extent and there are news of that at the date of fall of Berlin had already been built about 800 km , you are going to see in the following documentary that these tunnels exist and have been hidden from the general public, thanks to some intrepid archaeologists today we are raising the tip of the veil on this issue.